When people in the greater Chicago area come to our practice, we always let them know that they can count on our team for help. We offer advanced restorative dentistry treatments that can address even the most serious of wellness issues. This includes severe tooth decay as well as periodontal disease that negatively affects the health of your gums. Gum disease refers tot he bacterial infection of the gum tissue. It caused by the same oral bacteria that causes tooth decay and bad breath. In its earliest stages, gum disease can cause gum irritation and discomfort. At later stages, gum disease can cause major dental health and general wellness issues, including tooth loss. 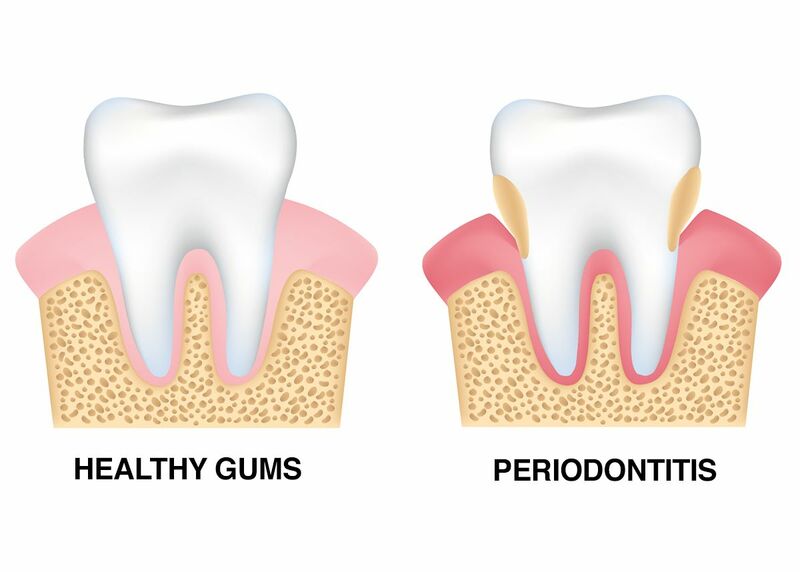 When gum disease progresses to periodontitis and advanced periodontitis, people will notice a number of serious issues when it comes to the stability possibly even the position of their teeth. The gum tissue will often recede from around the tooth, exposing more of the tooth's root. When the gum tissue is seriously inflamed, teeth can start to come loose. They may be wiggly in position or even shift out of their original position. In all of these cases, the loosening of the teeth from gum disease makes tooth loss far more likely to occur. We noted above that gum recession causes more of the tooth structure to become exposed. When this happens, it's possible for people to experience gum disease below their gumline, which can be very difficult to treat. This kind of gum disease makes root canal infections and other serious dental health issues more likely. In some cases, patients will lose teeth due to tooth decay that compromises tooth strength. In other cases, people may lose teeth because extraction is the only viable option for reducing pain and preventing the spread of the root canal infection. Studies have found that smoking can contribute to the likelihood of tooth loss. People who smoke a pack of cigarettes a day for 10 years are more likely to be missing one tooth to three teeth, whereas non-smokers are less likely to have experienced any tooth loss. Smoking and the use of tobacco products makes gum disease more likely, which means that in addition to the damage done by smoking per se, it's compounded by the dangers of gum disease. Treating gum disease means getting the infection under control and then restoring any damaged or lost gum tissue. Initially this will involve the use of antiseptic rinses and antibiotics to help reduce inflammation. Grafting oral surgeries can then be performed to help counteract gum recession. If you have lost a tooth or multiple teeth related to gum disease, the use of a dental bridge or a denture may be recommended. Some patients may qualify for dental implants, which are artificial tooth roots that are surgically embedded into jawbone and gum tissue. To learn more about treating gum disease and other serious dental wellness issues, be sure to contact our cosmetic and restorative dental practice today. We look forward to your visit and helping you smile with renewed confidence.